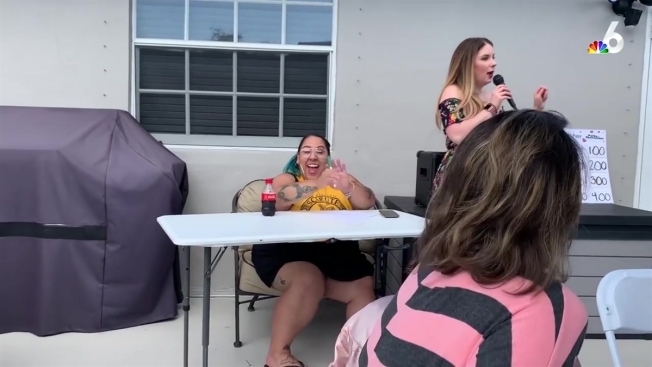 A South Florida woman's bridal shower paid homage to the popular series "The Office." Bells. Bouquets. Bridal shower shenanigans. It’s not Dwight Schrute’s infamous “Bears. Beets. Battlestar Galactica” slogan, but it still captures the essence of one Florida bride-to-be’s elaborately themed “The Office” bridal shower. Kayleigh Brown, of Fort Lauderdale, Fla., posted pictures from the fan-filled event on her Facebook page, where it quickly went viral. From cookies decorated with sayings like "I. Declare. Matrimony! ", to banners and plaques paying homage to some of the show's funniest jibes, the event was one the Party Planning Committee would certainly endorse. A mug emblazoned with the message “World’s Best Bride” – a play on character Michael Scott’s (played by Steve Carell) “World’s Best Boss” mug – was another prop instantly recognizable to fans. The post was shared more than 56,000 times on Facebook, and the location was even tagged as Scranton, Pennsylvania – the same city “The Office” is set in. “P.S. we don’t live in Scranton! We live in Fort Lauderdale, FL. I tagged Scranton to stay on theme, not realizing this would blow up!” Brown, a content creator and YouTuber, wrote in the post. Even some “Office” alumni caught on to the post, sharing it on their social media accounts. Brown said her bridesmaids planned the shower for her as a surprise. You can check out the full Facebook post below.